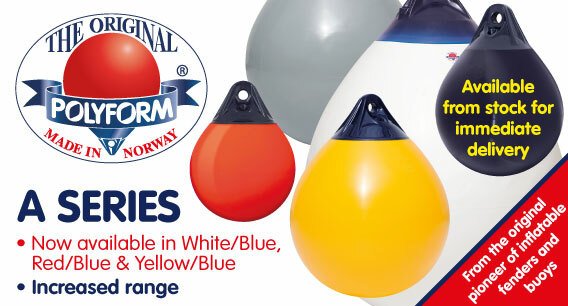 Following strong sales of the Polyform Norway range, which was introduced by Bainbridge in November last year, the range has now been expanded to offer Red and Yellow coloured A Series buoys to match the existing range of White with Blue top. The popularity of the range is mainly down to the exceptional quality of manufacture and care with which this range is made - something that has come from the years of innovation Polyform Norway have brought to the market since they first invented the inflatable PVC buoy in the 1950's. This quality can be seen in all the buoys and fenders they make, and, specifically in the A Series range as the rope hold eyes are solid injection moulded, which gives incredible strength and unbeatable performance in operation - none of the problems associated with standard fender production with hollow rope holds and brittle ferrules which affect these buoys. The Red and Yellow additions further add to this renowned range of quality marine products, and are now available to order on the Bainbridge Marine website - visit our site to find out more.